I'm so excited to share part 3 of my mug collection today because these are my more spookier mugs. I wanted to keep this post dedicated to my Halloween mugs so it may be short. These mugs are perfect for Halloween time and are great to drink out of in the late fall nights while watching a Halloween movie. First up is this mug set that I purchased at Disneyland a year or two ago. 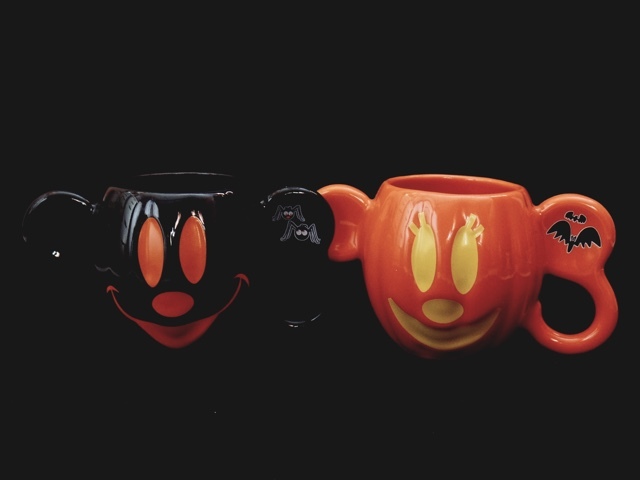 I fell in love with these Disneyland Halloween Mickey and Minnie Jack O Lantern mug set as soon as I laid my eyes on them. I really like how these mugs aren't very large like most Disney mugs so you can make yourself a smaller cup of coffee, hot chocolate or tea, which every you choose. On the handle of each mug you will see a different design. Minnie is an orange jack o lantern and her on the handle there are a couple of bats while Mickey is black with two baby spiders. You can also find Happy Halloween written on the back of each mug. The next mug is another mug set and can you believe it isn't Disney related! I got these Mr. and Mrs. Skeleton (or day of the dead?) mugs at Marshalls in mid September when they were barely bringing out Halloween decor. As soon as I spotted these two mugs I thought they were perfect for Rudy and I. I love how simple they are with the mug being white and on the inside its black. Plus it's always fun to have festive mugs during the holidays. Now back to Disney, I'm not sure if these two are even considered to be mugs. I purchased these Mickey and Minnie Halloween tumblers about two or three years ago at Target. On top they each came with some candy but I bought them to mainly use as decor. I've never actually used it to drink out of. I think they are so adorable and love it when Mickey and Minnie are dressed up in costumes. Now for the last mug in today's post and it's definitely my newest favorite. This is the Disney Parks Snow White Poison Apple mug. 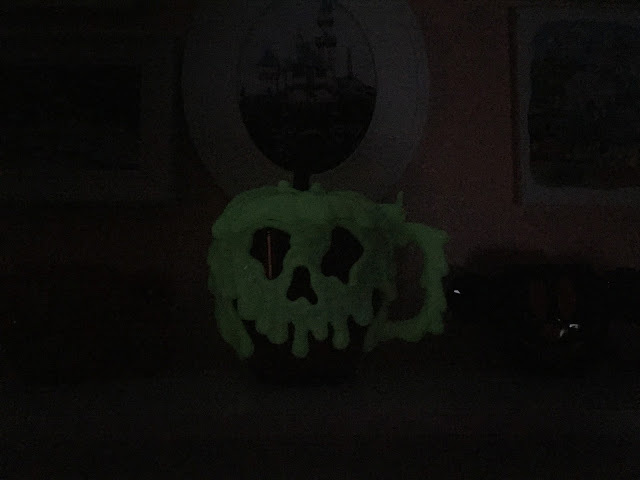 This mug was first released last year during Halloween time at Disneyland and sold out almost immediately. Unfortunately I was unable to get my hands on one last year but thankfully Disney brought them back this year with a larger amount of quantities. While Rudy and I were at Disneyland for our birthdays purchasing this mug was the first thing we did and I'm so happy to finally own it! About a week after we left the mugs were all sold out! 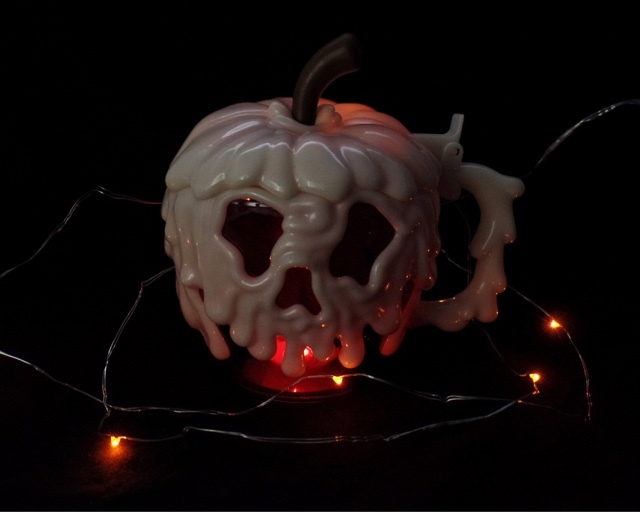 This mug is a replica of the poison apple from Snow White and the top lid opens up. The mug is pretty large and beautiful! What's really cool about the mug is that it glows in the dark. This is the end of part 3 of my mug collection, I hope you enjoyed reading about my Halloween mugs. Until next time! The struggle was real with getting that poison apple mug. 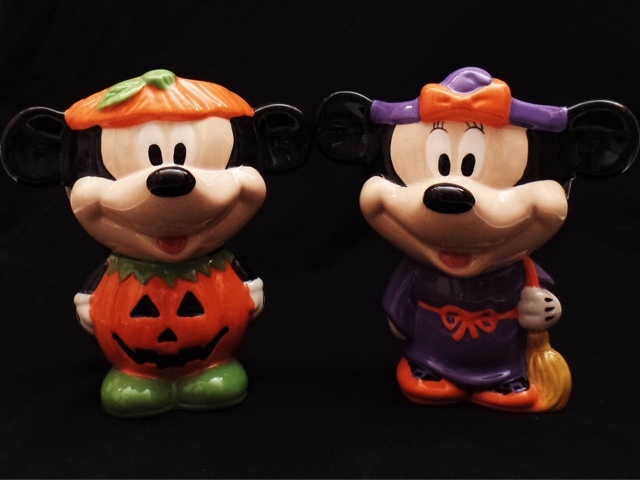 I love the Mickey and Minnie Halloween tumblers those are so cute! Thank you! I wish they brought some more out this year. I know they usually bring some for Xmas too. Oh my gosh, so cute! I don't drink hot drinks so I buy mugs at Disney and pass them off as gifts for my tea-drinking partner haha! I'm the same as you then, I don't like hot drinks haha. I usually use my mugs for any iced drinks or on a rare occasion hot chocolates. Most of the time they are for guests or display ;) Disney mugs are the best!